The new Apple Pencil will be paired with iPad Pro by proximity, much like AirPods or HomePod. Switching between devices will be possible without connecting the Apple Pencil to the charging port. It's unclear whether the current model of Apple Pencil will work with the new iPad. It's unclear if the new Apple Pencil will be compatible with previous iPad Pro models or the sixth-generation iPad. Bloomberg's Mark Gurman said Apple was working on a new Apple Pencil and new software tools for using the stylus back in November 2017, but few details have surfaced until now, beyond a patent filing for a more precise version of the drawing tool that would incorporate ultrasonic technology. The current Apple Pencil launched alongside the original iPad Pro in November 2015, and hasn't been refreshed since. The $99 drawing tool gained support for the sixth-generation 9.7-inch iPad earlier this year. Rambo said the new iPad Pro will have an edge-to-edge display without a home button, as rumored several times. 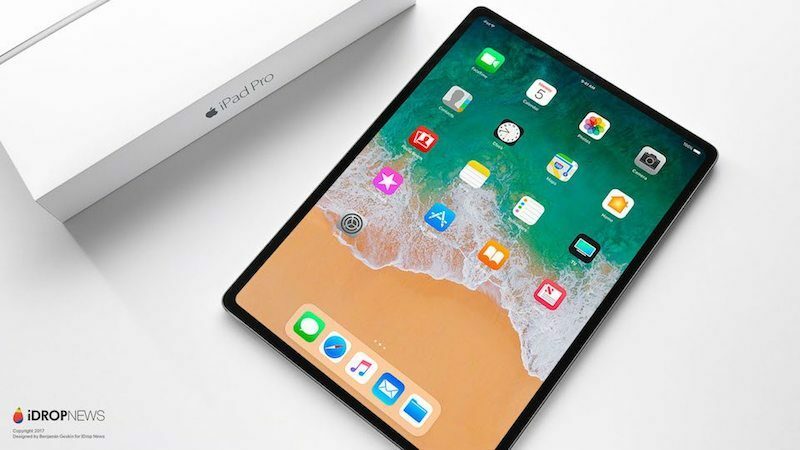 Unlike the iPhone X, he said the new iPad Pro will not have a notch, as the bezels are said to be wide enough to accommodate the TrueDepth camera and sensor array necessary for Face ID. Face ID on the new iPad Pro will work in both portrait and landscape orientations, according to the report. Rambo also corroborates rumors about the iPad Pro with Face ID having a new rear-facing Magnetic Connector for connecting accessories, such as a new Smart Keyboard. Earlier this year, rumors and a CAD drawing suggested the Smart Connector will be relocated to the lower back side of the device. The report also corroborates Apple analyst Ming-Chi Kuo's claim that the new iPad Pro will have a USB-C port. The new connector will enable 4K HDR video output to external displays, with new settings to control resolution, HDR, and brightness on connected external displays, according to Rambo. Apple will likely unveil the iPad Pro with Face ID and the new Apple Pencil at a media event later this month, although no date has been announced as of yet. Apple is also expected to announce updates to several Mac models at the event, including the MacBook and/or MacBook Air, iMac, and Mac mini. Apple's event could take place on Tuesday, Wednesday, or Thursday of next week, in which case invitations should go out within the next few days. The next option would likely be Tuesday, October 30, as Apple CEO Tim Cook will be in Brussels on Wednesday, October 24, likely ruling out an event that week. Excellent! I've often thought the Pencil could take some cues from AirPods. But why stop with pairing? I wish pencil 2 came with an eraser. And I really hope it has an off switch. My battery is always dead. It’s fast to recharge, but it really shouldn’t discharge if I don’t use it. The real surprise will be if the new Apple pencils work with the Xs/xr. I want AirPower and AirPods wireless case. I know there is slim chance they'll introduce an updated iPad Mini 4, but has there been any hints at a price drop, or an update to the internals? I too would love this to be true, but I’ve heard nothing. How cool would it be if apple slimmed the bezels on the ipad mini making the 7.9” screen 8.5” with face ID and pencil support! That’d be so cool. The perfect travel size ipad. At least update the ipad mini and give it pencil support tho. I may be finally time to update my original iPad Air. Will be great if the new Apple pencil charges wirelessly thru the new magnetic connector on the ipad. That’d be cool. No more having to awkwardly stick the pencil into the lightning port....and losing the cap! so... apple has invented the #2 pencil. And if there is no update, at least drop the asking price. $399 for the dated iPad Mini 4 is just bananas. I’m really surprised we keep calling the new iPhones and this new iPad “edge to edge”. It’s not truly at the edge Lol. Better off saying “ultra thin bezels” or something. Because what happens when it TRULY becomes edge to edge one day? Apple Marketing knows how to prepend prefix terms and append suffix terms at will. "Comparing the Infinity & Beyond to just the Infinity 8K through my electron microscope (sold separately) makes it obvious that I must, MUST upgrade to the Infinity & Beyond screen. At 50K times magnification, the lessor just looks so obviously inferior... made my bionic-eye-enhanced Raptor nearly vomit. How did we ever get by with the Infinity Retina 8K?"